Cut two hearts from gold glitter card and glue together, sandwiching a wooden skewer in between (it’s a good idea to break to sharp tip off first). Print your chosen digital paper onto white card. 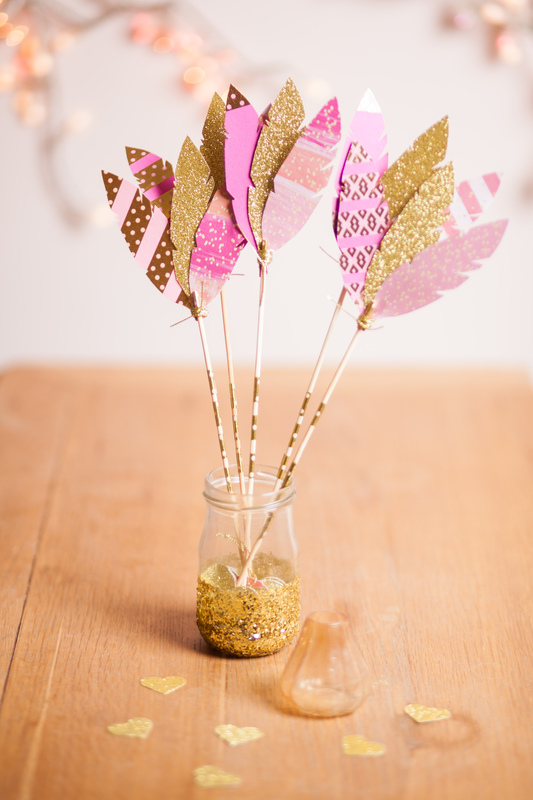 Cut out a feather shape from this, plain pink card and gold glitter card. Stick washi tape across the plain pink feather, trimming the edges. Stick your three feathers together at the ends, then bend them slightly to shape them around the top of the skewer. Stick in place with glue. 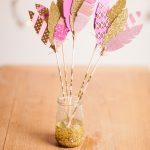 Wrap the feathers with metallic twine to hide the join and make them more secure. Add strips of washi tape around the metal skewer to finish. You can use these as place settings by adding a luggage tag with your guests’ names written on them, or simply display them in a jam jar to add interest to a cake table or sweetie bar. 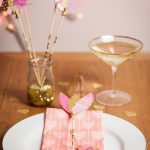 Just a quick question: do you have any tips on crafts photography? Would love to hear any. Your photos are amazing!